How to Get Rid of Blisters? : A blister is essentially a small pocket of body fluid which could comprise of pus, blood, plasma or serum. Blisters are formed when your skin has been damaged and is confined to the upper layers of the skin. It happens in the presence of friction, heat, cold, or in some cases, chemical exposure. What happens is that fluid accumulates between the epidermis and the layers beneath it. This fluid acts as a barrier, protecting the lower layers of your skin from further damage. It, in turn, is tied to a faster recovery. If you’re looking to heal a blister, it is essential that you do not pop it under any circumstance. When you pop a blister, you slow down the process of healing by quite a bit. So, refrain from doing so at any cost. 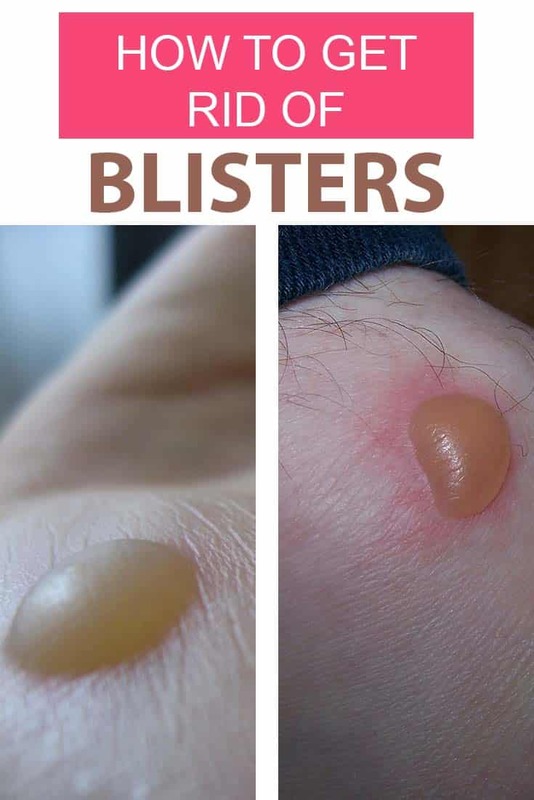 Before we delve into the home remedies for blisters, let’s analyze the causes of it. If prevention is better than cure, then this little snippet might come in handy. Fever blisters are caused by sharing of towels, handkerchiefs or even lip balm. The virus can quickly spread through cuts and bruises on the skin. Lip injury of any kind. how to get rid of blisters fast? Here are some tried and tested home remedies for blisters. The antibacterial and anti-inflammatory properties that apple cider vinegar possesses makes it an effective home remedy for the treatment of blisters. If you want to rid yourself of infections, pain, and inflammation, then this is the home remedy for you. Dip a ball of cotton into apple cider vinegar. Apply this onto the affected areas, allowing it to dry for some time. ACV tends to be harsh on your skin, which is why it is essential to dilute it with water before application. This is another remedy you could experiment with. Mix in half a teaspoon of onion paste with a teaspoon of apple cider vinegar and apply this to the blister. Allow this paste to dry before you rinse it off with warm water. Follow either of these two remedies for long lasting effects. Also read: How to Get Rid of Fever Blisters? Home remedies are often incomplete without the presence of the ubiquitous aloe vera. One major reason being the fact that it reduces inflammation like magic. Also, its antimicrobial properties neutralize infection-causing pathogens such as Staphylococcus aureus and Candida albicans. An added benefit of aloe vera is that it keeps your skin hydrated. It is attributed to the fact that aloe vera is composed of 99.3% of water. However, keep in mind that the best way to prevent infection is to make sure that the blisters do not break out. Combine one teaspoon of aloe vera with one teaspoon of Vitamin E.
Apply this mixture on the blisters. Wash it off with cold water soon after. Repeat this process two or three times a day for about five days. Must read: How to Get Rid of Cold Sores Fast? Green tea reduces the pain and swelling that is associated with blisters. It also aids in the healing of blisters due to the presence of several antioxidants and vitamins. Steep a green tea bag in a cup of boiling water for about five minutes. Let the tea bag cool before placing it on the blister. Repeat this process about four or five times every day to speed up healing. You could also consume green tea about two or three times a day to speed up the process of healing. Look out for tea tree oil’s antibacterial as well as astringent properties to treat blisters. You can also keep the risk of recurrent infection at bay with regular usage of tea tree oil. Dilute one part of tea tree oil with three parts of plain water or vegetable oil. With the help of a cotton ball, apply this solution on the affected areas. Let this sit for ten minutes or so before rinsing it off with cold water. This treatment can be followed up two or three times a day until the blisters subside. Must read: How to Get Rid of Canker Sores Fast? The many benefits of Epsom salt are yet to come into the limelight. If you did not know, it is actually an excellent home remedy to rid you of blisters by draining and in turn drying out the blister. It encourages healing, thereby preventing infection. Look out for the benefits of Epsom salt to get instant relief from inflammation, abdominal cramping, and muscle pain too. For this remedy, you require Epsom salt, a basin of water and some petroleum jelly. Dissolve the Epsom salt in a basin of water. Soak the affected area in the basin for about ten to fifteen minutes. Soon after, dry the area and apply petroleum jelly to it. Repeat this process three times a day for long lasting results. Vitamin E Oil can be used to treat blisters, right in the comfort of your home. Skin and hair care regimes often incorporate Vitamin E either directly or indirectly. It is particularly due to the anti-aging benefits which reduce the signs of aging including wrinkles and fine lines. Vitamin E is also great to heal the skin from all ailments. Extract the oil from a vitamin E capsule. Add calendula oil to this and mix it well. Spread this on the blister, leaving it on for thirty minutes before wiping it off. Repeat this twice a day for an entire week. Castor Oil helps in the treatment of blisters as it keeps the affected area moisturized when applied on a regular basis. This will in turn, reduce itchiness and aid in the healing process. Apply castor oil onto the blister and leave it overnight. Repeat this for about two or three days. The blisters tend to dry out by this time. You could also mix three teaspoons of castor oil into half a cup of white vinegar. Rub this solution on the blister for a few days. Blisters can be treated right in your home with these simple ingredients. Look no further for these hacks are going to be all you need and more to rid yourself of blisters in their entirety.